HomeConnor Cochran lost lawsuit for stealing from a publisher, with thousands seized from his bank. Here’s what it means for his defense about fraud. Connor Cochran lost lawsuit for stealing from a publisher, with thousands seized from his bank. Here’s what it means for his defense about fraud. Connor Cochran lied to the public about the lawsuit, documented below. The Last Unicorn fraud story has a clear right side and wrong side. In this update, we share yet another reason not to sit on the fence. Please stand with Peter Beagle. “This isn’t the first time Cochran has been sued in the publishing world. February 2010: Baker and Taylor sued Cochran for approximately $6300 for breach of contract. Cochran’s response to this lawsuit is here, and claims he was offered other terms. However, there’s no written documentation of those alternate terms, aside from an email that, to my non-lawyer mind, is in no way a written contract. August 2011: Sydney Clemens sued Cochran for for the return of $25,000 she invested in Cochran’s company as part of a signed 2009 agreement promising her work would be published within 12 months. Cochran did not publish Clemens’ work within that time frame. Penguin Group (usa) Inc. v. Conlan Press, Inc., San Mateo Superior Court, case #CLJ511166. Public records indicate that the plaintiff in that matter obtained a default judgment against Conlan and a writ of execution was issued in the amount of $6001.28. The judgment was finally satisfied in early 2015. In plain words, it wasn’t paid and dropped. He lost; they took it from his bank. 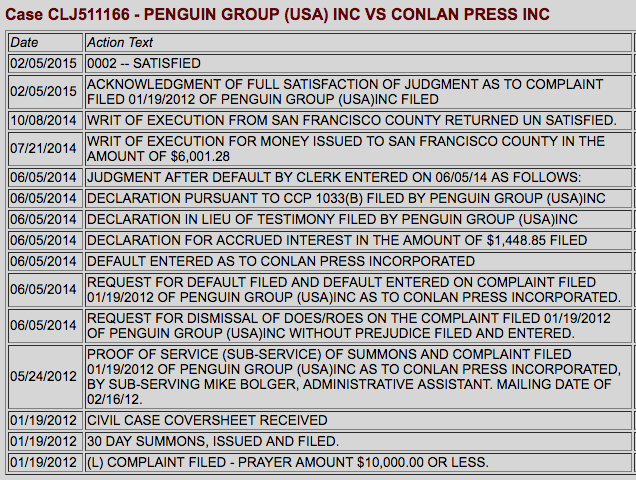 Penguin sued someone with so much guilt that he didn’t bother to answer in court. The court judged against Cochran months before he made the above claims. They didn’t just award the original $3000, they doubled it. He thought nobody would notice and claimed it was paid and dropped. Then on 2/5/15, Cochran’s bank account was levied for $6,001.28. Soon after, he deleted conlanpress.com/fansagainstfraud. If you find yourself on the fence about sides of the story, please remember the deception you can see here. There is no credibility for Cochran’s defenses about defrauding Peter Beagle and his fans. And if you run into his smokescreen again, we recommend to be prepared with info like this: Diversion Tactics used by Highly Manipulative Narcissists and Sociopaths. That’s not an insult, it’s a sincere warning. Thanks to all who stand with Peter. Jim Hines shared info publicized here without linking us, avoiding too strong of a stand. That’s completely understandable. Sharing the info accomplishes our goal and we want nothing more than fairness. But there soon won’t be any need for delicacy. After Cochran’s decade of cheating against fans, associates, and ultimately Peter, the chickens are coming home to roost. an increasingly upset and angry fanbase. Our greatest hope is that enough fans will stand with Peter so that we can finally end our effort and see justice for all. Please share with hashtag #TakeBackTheUnicorn. ← Win for Peter Beagle: THEY LIED when they attacked his health. Conservatorship case dumped, clearing path for Elder Abuse lawsuit against Connor Cochran. Connor still looking to “chat” with people instead of just giving them what they paid for 7 years ago. Hi Lotte. Sorry you fell victim to a sleazy fraud. Conlan Press is a scam operation and Connor Cochran keeps “pre selling” things that will never be made. He has a long list of people waiting from the scams and the list keeps getting longer while he “pre sells” to new people. They have already waited for 12 years. That means if you ask for help from the scammer, you will still be asking in the year 2027. Contact the authorities now. The “report” and “call for investigation” sections on the side of this site has places to call. Start with the Attorney General. And definitely put your story out in public wherever you can.